The joy flows from Scotty Biggs as he mentions the best sign he saw from the 44th annual March for Life in Washington on Jan. 27. The “sign” involved the transformation in the 32 youths who attended the march from St. Bartholomew Parish in Columbus, where Biggs serves as coordinator of youth ministry. 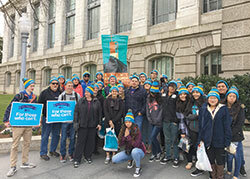 Before the march, Biggs noticed that many of the youths from St. Bartholomew often struggled to publicly proclaim their pro-life beliefs—because too few of their fellow students in the public high schools they attend share those beliefs. “Since coming back from the march, they’re changing their Facebook profiles to photos of the march,” Biggs says, the enthusiasm filling his voice. “They’re posting on Instagram, and they’re posting on Twitter about the impact the march has had in their lives. Hundreds of young people from across the Archdiocese of Indianapolis contributed to that witness. Buses filled with youths from the New Albany, Indianapolis North and Indianapolis West deaneries made the journey to Washington. Other groups from the archdiocese included youths from All Saints Parish in Dearborn County, St. Charles Borromeo Parish in Bloomington, St. John the Baptist Parish in Starlight, St. Malachy Parish in Brownsburg, St. Mary Parish in Navilleton and St. Teresa Benedicta of the Cross Parish in Bright. At 18, Graydon Chisholm was one of the 32 youths from St. Bartholomew Parish who joined the March for Life. 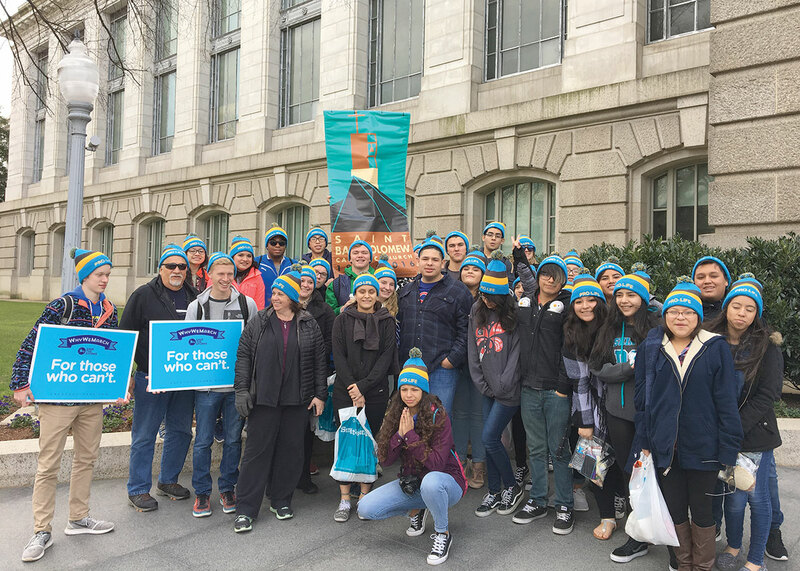 “I see the trip to the March for Life as one of the greatest opportunities to grow in my faith,” says Graydon who planned and led most of his parish group’s trip to Washington. “But honestly, the march itself is not my favorite part of the pilgrimage. Grace Oberhausen was one of 49 students from Marian University in Indianapolis who traveled to Washington for the march—a journey to stand up for life that the 21-year-old college junior made for the sixth time. “It’s a cause I’m very passionate about. I really believe in it, and it’s something that young people have a voice for,” says Oberhausen, a member of Our Lady of Good Hope Parish in Fort Wayne, Ind., in the Diocese of Fort Wayne-South Bend. “I like that I’m able to be a voice for the voiceless. She experienced a different feel to this year’s march than previous ones. Part of that feeling was the increased national media coverage that the march received, coverage that had been mostly non-existent in previous years. Part of it was the people who protested against them for their witness for their pro-life beliefs. Part of it was all the focus on the start of the presidency of Donald J. Trump, she says. The appearance of U.S. Vice President Mike Pence—who shared a pro-life message with the crowd on the National Mall—added another memorable quality to the day for her. “Having the vice president there for the first time ever, being out there on the National Mall, it was particularly impactful,” she says. “During Vice President Mike Pence’s speech, there was all this cheering, and the amount of cheering was cool to hear. A similar impact was experienced by the 42 youths from Our Lady of the Greenwood Parish in Greenwood who joined the march. “It’s not just about abortion, it’s about life itself,” she says. “So many teenagers attempt, commit or think about suicide. It’s something we need to pray about—that people can cope with situations in their lives. And we need to pray for people who plan their death.